There’s nothing like the complete lack of mobile signal and wifi on the Hebrides to make you sit back and just enjoy being. I have spent time on most of the Hebridean islands and work quite frequently on the Isle of Lewis and Isle of Harris. Mostly, I stay in Harris as I love the beaches there, but this time my work brought me to stay in Lewis for a few days. Straight off the ferry journey from Ullapool to Stornoway and I headed out to Cross in the north of Lewis. I was scheduled to do a shoot for House Beautiful Magazine and we somehow hit lucky with clear blue skies and a hint of warmth in the air. So it was a fun afternoon on the beach photographing the family for the magazine. 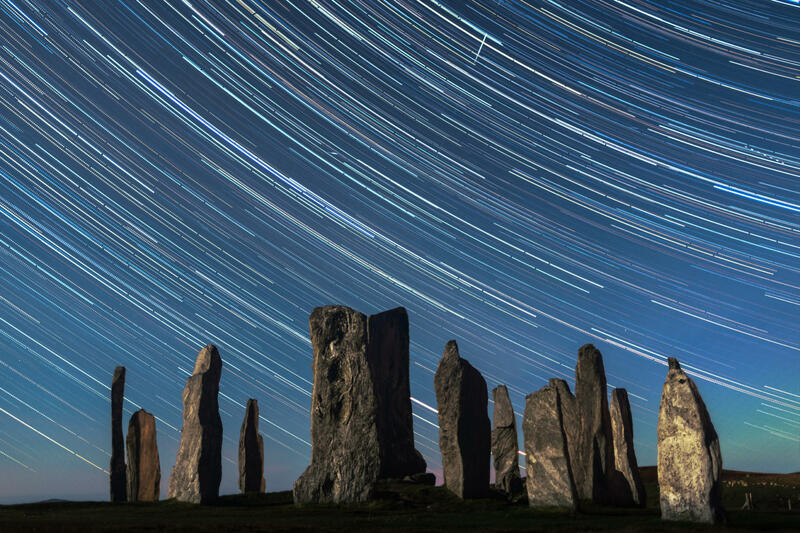 The forecast was for a clear, cloud free night so I have already decided to head out to Callanish do try something I have wanted to do for ages; photograph star trails over the standing stones. I was beaten to it by another photographer and unable to start unless there was complete darkness so had a cup of tea and settled down in my van for a while. When he had left, I set up my cameras to run for the next couple of hours and retrieved them at 11pm. One of the issues with star trail photography and Scotland is the cold and dewy air. This ruined the last section of the shoot as the lenses fogged up but still the first part was successful enough to create a fabulous image and also a nice time-lapse movie.